In 1960 Sadequain journeyed to Paris at the invitation of the French Committee of the International Association of Plastic Arts. This period of his career is considered by many to have been the zenith of his artistic output, and it was whilst in Paris that Sadequain completed one of his most important commissions; providing the illustrations for a newly published edition of Albert Camus’ seminal novel L’Etranger. Albert Camus was a French author, journalist and philosopher who was awarded the Nobel prize for literature in 1957. Originally published in 1942, L’Etranger (The Outsider), was his first novel and opens with the famous line; “Aujourd’hui, maman est morte. Ou peut-être hier, je ne sais pas“, (Mother died today. Or maybe yesterday, I don’t know). It is considered a classic of French literature, and in 1999 was voted number 1 in Le Mond’s list of the 100 greatest books of the 20th century. In 1964, four years after Camus’ untimely death, Sadequain was commissioned to produce a series of lithographs for the special edition of the book. It was published in October 1966 by ‘Les Bibliophiles de l’Automobile-club de France’, a society that was founded by the early motoring pioneer the Marquise de Dion in 1895, and which began publishing artist’s books in 1925. (Source: Koninklijke Bibliotheek). The book was published in a limited edition of 150 copies, with 120 copies dedicated to members. Sadequain created 22 colour prints, and a number of monochrome prints to illustrate key scenes in the book, which deals with themes such as the irrationality of the universe and importance of the physical world. At the time it was an unprecedented move by the publishers to engage Sadequain’s services. When one considers how many artists were working in Paris in the 1960s, it shows how highly regarded he was in Parisian artistic society at the time. The ‘L’Etranger‘ illustrations represent an extremely important body of work, but are only a small part of the rich output produced by Sadequain whilst in Paris, which will be discussed in greater detail here in due course. During Asian Art in London Grosvenor Gallery are holding an exhibition of etchings by the renowned Pakistani artist Abdur Rahman Chughtai. The show features sixteen different works, including editions of the iconic etchings Holy Man, Kashmiri Woodcutter and Endless Horizon, as well as rare images such as To Mecca, Mughal Princess and Mughal Lady. It is a wonderful opportunity to see such a large group displayed together, alongside an archive of letters from Chughtai to the British artist Paul Drury, who helped teach him the technique of print making in London in 1936. The exhibition ‘Chughtai’s Etchings: Editions of a Master‘, starts on the 29th October, and runs until the 12th November 2014. The online catalogue can be purchased from the gallery, and an online version can be accessed here. Along with Hamilton and Co, Grish Chunder Dutt was the premier silversmith operating in Calcutta, the centre of British activity in India which from 1790 was known as ‘The City of Palaces’. From 1872 to 1947 his workshop produced all manner of items including tea services, claret jugs, cups and boxes, and operated out of the district of Bohwanipur, located between the city and the famous shrine of the goddess at Kalighat. The firm was known for its characteristic depiction of rural scenes which often included images of farming, fetching water, or winnowing grain, as well as tales from Indian folklore and mythology, such as processions or festivals. 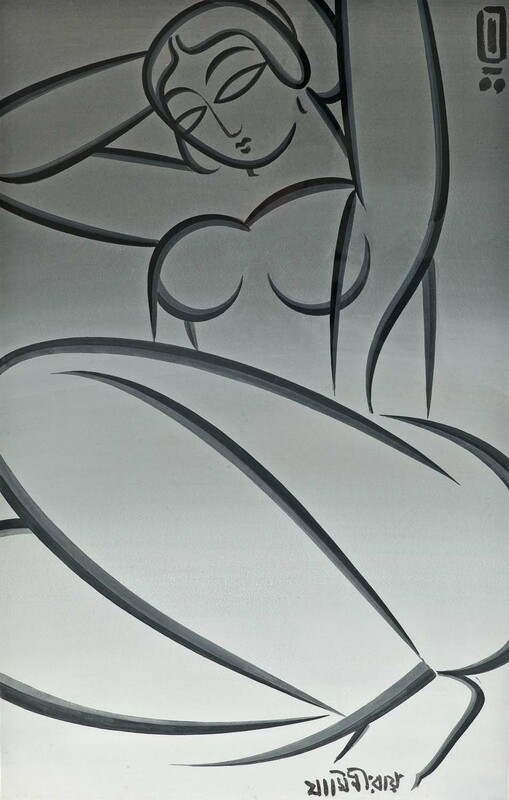 The figures in Dutt’s work have a very naive quality to them, and the repousse designs are incredibly tactile. The mountainous landscapes that appear in the background of a number of his pieces are also simplified, and seem to take inspiration from 19th century Japanese wash paintings, in the way that the mountains stack up on top of each other in bands, seen below. The skill of the craftsmen in Dutt’s workshop becomes apparent when one considers how even on small pieces a real sense of perspective is achieved. The proportion of the figures in relation to the background also gives these works a great sense of depth, a decorative feature mainly used by silversmiths from Calcutta, and which was introduced in the second half of the 19th century. Stylistically this set Dutt apart from Hamilton and Co, who were famous for their pared down designs, opting instead for a smooth finish and minimal decoration of their objects. Today Jamini Roy is the subject of a documentary on BBC Radio 4, titled Bengal to Baker Street in 80 Paintings. Nirmalya Kumar’s affinity with the work of Jamini Roy is discussed during the program, and various paintings from his extensive collection are mentioned in relation the evolution of the artist’s style. The program also discusses the history and influences of the artist and his position in Indian art history. Other contributors include Partha Mitter, Emeritus Professor of Art History, University of Sussex; Sona Datta, Curator of Indian and South Asian Art at the Essex Peabody Museum; Richard Blurton, curator of South Asian Art at the British Museum and the artist Sir Howard Hodgkin. 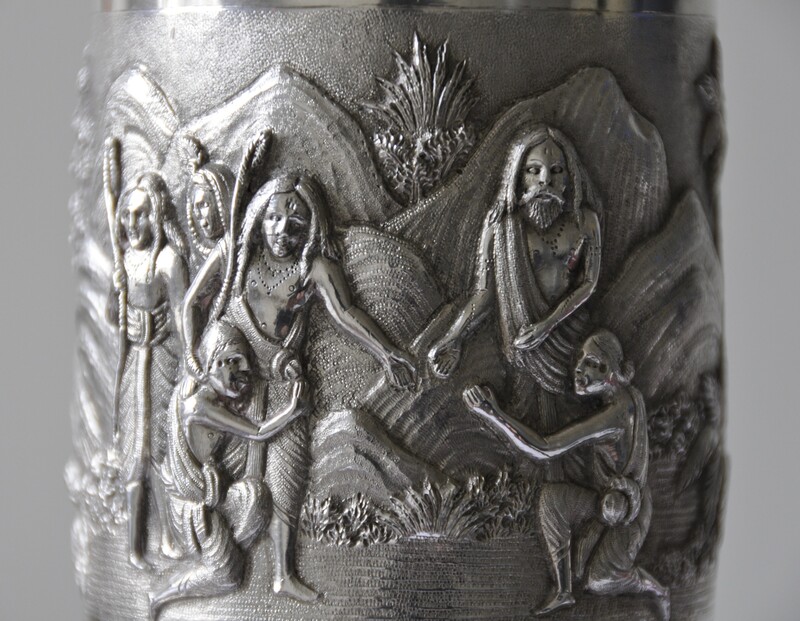 As mentioned in an earlier post, the work of Oomersi Mawji was considered to be the pinnacle of Kutch silver design in the late 19th century. From card cases and tea sets to punch bowls and salt cellars, the inventiveness of Oomersi Mawji and his workshop of silversmiths knew no bounds. The finely detailed and expertly worked material that was produced by this most revered manufacturer found its way around the world, and shops such as Liberty & Co. and Proctor & Co. in London held catalogues full of O.M.’s designs. 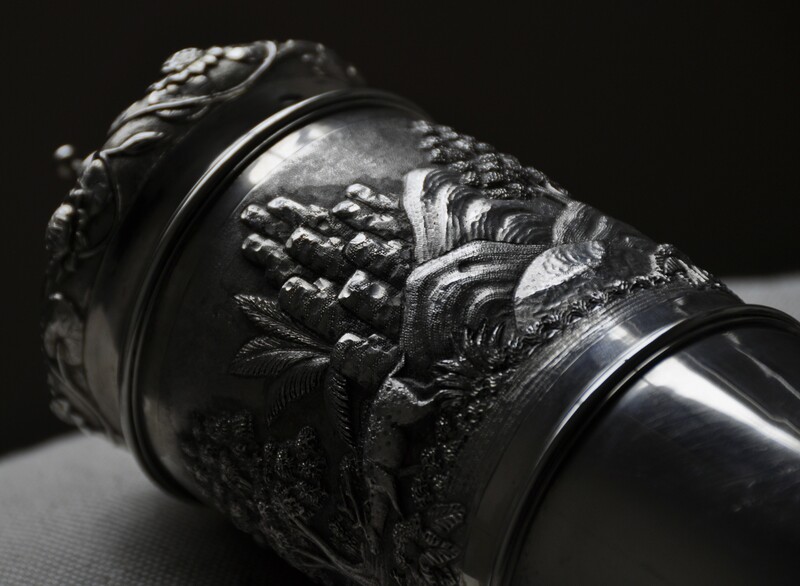 The success and popularity of this particular manufacturer enabled other Kutch silversmiths to successfully market their wares both in India and overseas. Claret Jug with Snake Handle, O.M. c.1890. 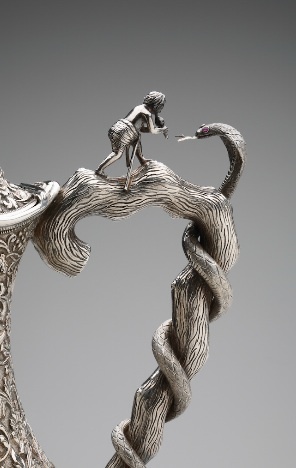 The most sought after designs were those that incorporated a witty or amusing detail, such as in this example, were a finial modeled as a boy charms a serpent whose tail snakes around a handle formed as a wooden branch. It was Oomersi Mawji’s artistic vision and sheer quality of execution that set this manufacturer apart from rival Kutch silversmiths. O.M.’s silversmiths produced material of an extremely high quality and with details crisply defined and scenes confidently executed. Whilst there were other manufacturers producing high quality material in the characteristic style for which Kutch silversmiths were known, no other company was able to match the workmanship of O.M.’s studios. 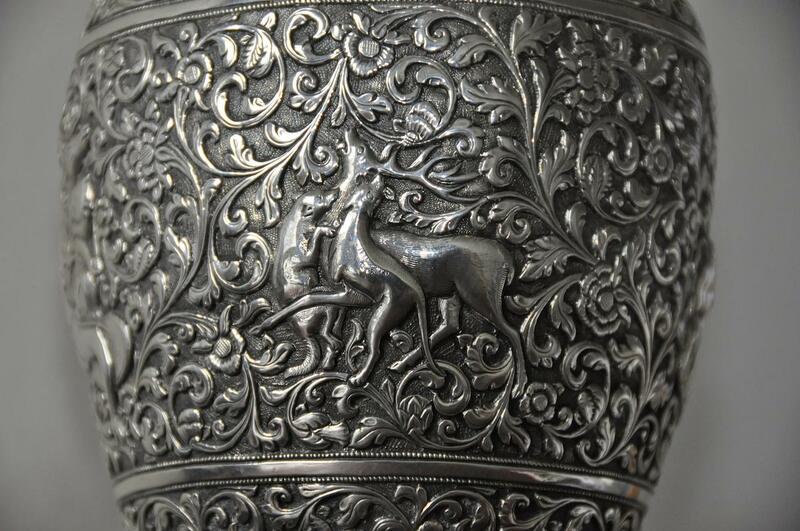 Here we see a detail from a claret jug in which a deer is attacked by two hunting dogs, surrounded by scrolling foliage, a scene typically reproduced on Kutch silverware of the period. Whist O.M. was perhaps the most famous there were of course an array of regional silversmiths working in India in the later stages of the 19th century, each of which produced vastly different designs. Some of these will be discussed here, including the work of Grish Chunder Dutt, a silversmith based in Bohwanipur in Calcutta, whose pieces featured scenes often inspired by Hindu mythology. The Pakistani artist Bashir Mirza is best known for his series Lonely Girls. These colourful and striking depictions of women were executed throughout the 1970s following his return from Germany, where he spent a number of years and took various inspiration. 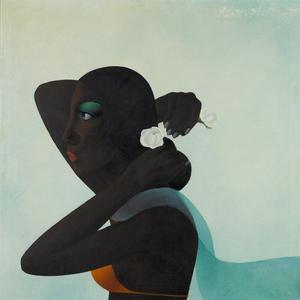 These painstaking and vibrant paintings were the artist’s most complete works, and drew critical acclaim amongst the Pakistani art scene when first exhibited in Karachi in the early 1970s. Whilst he is most revered for his Lonely Girls, Mirza also produced a series titled Portrait of Pakistan. First published in 1967, this was a portfolio of prints of men and women from around the country which proved to be enormously popular. The original line drawings from which the series were made were characterised by confident, angular lines and cross hatching, built up in an almost frantic way to eventually reveal the subject. This style of drawing initially appeared in his oeuvre in the mid-1960s during a series created in response to the war against India in 1965. In Image and Identity: Painting and Sculpture in Pakistan, Naqvi describes this style as having been influenced by Sadequain’s intricately woven paintings on Ghalib’s verses. He also goes on to say that although clearly influenced by Sadequain and Shakir Ali, what was remarkable was Mirza’s ability to place his own stamp on the elements borrowed from these masters. Mirza’s skillful mastery of this difficult technique can be observed in the delicately executed, yet strong features of the turbaned man shown here. He was able to lend his drawings a strong sense of perspective, achieved by placing the figure on a blank background so as to focus the viewers full attention on the subject, as well as by adeptly depicting areas of shadow and highlight using different densities of shading and hatching. 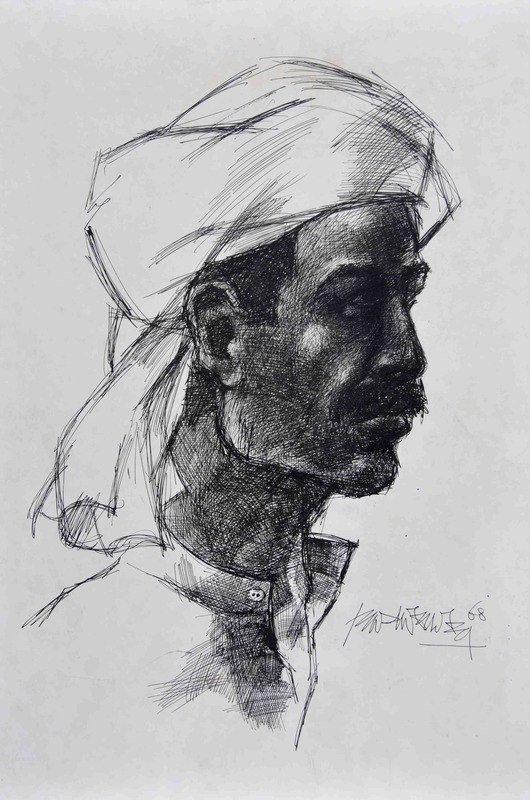 Along with his Lonely Girls, Mirza’s men and women of Pakistan are amongst his most recognisable works, and capture beautifully the rugged native peoples of his homeland in a technically adept and striking manner. Born in Simla in 1931, Avinash Chandra studied in Delhi before moving to London in 1956, and it was there that he honed his artistic skills, influenced initially by Van Gogh and Chaim Soutine. His new surroundings helped him flourish and escape the artistic ideals imposed upon him in Delhi. Moderate success followed his immediate move, however it was in the late 1950s/early 1960s that he saw real progress. 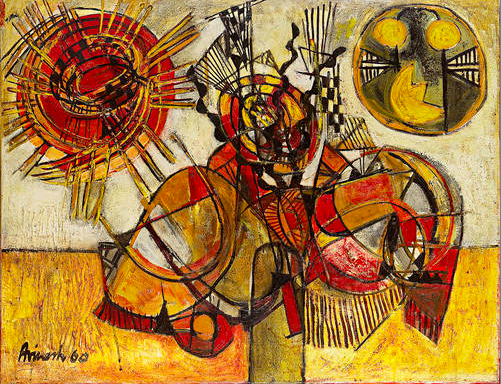 Indeed the 1960s could be said to have been the artist’s zenith, as from his base in North London, Chandra exhibited extensively throughout Europe and the USA, and in 1965 was the first Indian artist to be represented at the Tate Gallery with the vibrant work Hills of Gold. In 1962 the BBC produced a program about the artist as part of their ‘Monitor 101’ series, exposing him to the public at large. 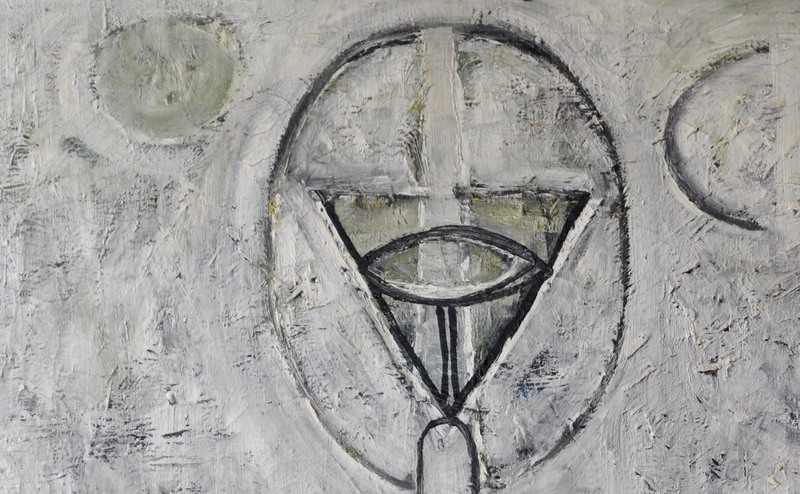 His vernacular from the 1960s is one of mystical floating objects and celestial bodies seamlessly interwoven with elements from traditional Hindu mythology such as the lingam/yoni and the ajna chakra. This style was very different from that of his earlier works which usually featured depictions of landscapes and nature. The work depicted above is one such example which incorporates a range of varied and intriguing subjects. It is also relatively rare due to the subtle use of colour. When viewed closely however, one can see that beneath the thin veil of white paint is layer upon layer of colour, built up to create a highly textured surface. 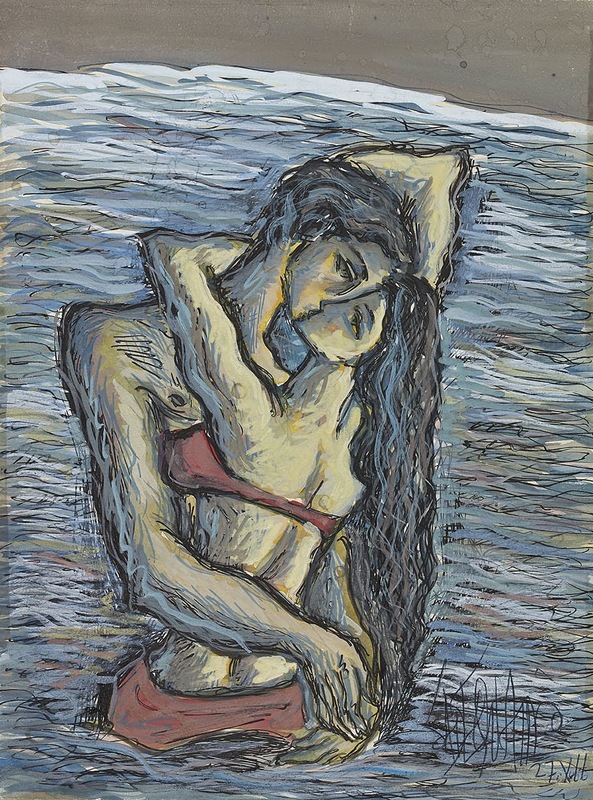 This technique gives the work a great sense of depth, movement and dynamism, the like of which is rarely seen in his paintings from the 1970s and 80s, in which the subjects are more overtly sexual in their nature.